10. Bill Spoon's Barbecue in Charlotte, NC, a family-owned business home to pulled pork BBQ served with Southern-style hushpuppies and Brunswick stew. 9. Bulldog Barbecue in Miami, FL, run by former Top Chef contestant Howie "Bulldog" Kleinberg. It's a low-key establishment where diners are meant to get their hands dirty -- with rolls of much-needed paper towels available at every table. 8. The Joint in New Orleans, LA, recognized for smoky Cajun sausages and beef brisket as well as two house varieties of homemade BBQ sauce. 7. Uncle John's BBQ in Chicago, IL, one of many excellent barbecue locations in this culinary city. It's a stand-out choice for the heaping servings of beef brisket and signature sage pork sausage links, smoked and lightly charred until crisp. 6. 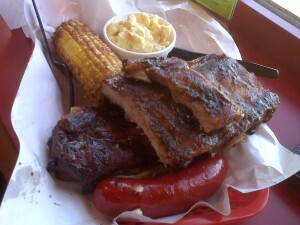 Slows Bar BQ in Detroit, MI, known for a varied menu that cites influences all across the U.S. (i.e. St. Louis spare ribs and Carolina pulled pork). But their signature smoked chicken dish gets especially high marks for its juicy texture and savory flavors -- often ordered with a side of Slows' popular mac 'n cheese. 5. Snow's BBQ in Lexington, TX, a small town eatery with "good food, good service" and classic dishes that are worth waiting for. Due to its popularity, Snow's opens bright and early at 8 a.m., shutting down whenever they run out of meat to serve. 4. Arthur Bryant's in Kansas City, MO, a famed establishment open since the 1920s and home to Arthur Bryant's special recipe for thick BBQ sauce made with tomatoes and molasses. 3. Blue Smoke in New York City, NY, helmed by celebrity chef Kenny Callaghan, an original pioneer of the "urban barbecue movement" in NYC ten years ago. The menu at Blue Smoke is inspired from the nation's top BBQ meccas as well, featuring Memphis baby back ribs and Texas beef brisket. 2. Kreuz Market in Lockhart, TX, a historic stand-out serving smoked American and German barbecue dishes since 1900. It's best known for a large variety of homemade sausages (such as jalapeno cheese) and no BBQ sauce. "Nothing to hide," reads a sign at the counter. 1. Pappy's Smokehouse in St. Louis, MO, garnering the number-one spot for a menu with something for everyone, from classic dishes to inspired creations (like dry-rubbed ribs slowly smoked over cherry and apple wood). It's another BBQ joint with "nothing to hide, so the sauce is on the side," says owner Mike "Smokey" Emerson.